I presented my pink two-tone 1967 shift dress, and explained it was unwearable due to my following the instructions and underlining it with silk organza. As Lynn Malley noted, it felt like a hair shirt. Well not quite that bad, but really not nice. I had lots of feedback and suggestions – many thanks. Lots of urging to just bite the bullet and line it, even if some deconstruction (or careful handstiching) was required. Other, knowing commentators, said it would be quicker and easier to start again and avoid making the same mistake. My solution, today, was actually to wear a good quality slip (petticoat) that meant little of the surface actually was in touch with my skin. I also wore the dress with the yellow jacket. A bit bright maybe, but why not? It is summer, but a bit cool. I may make a lining “in due course”. I agree with a number of you that it is often easier to do the garment again rather than fix it once it is finished. I mentioned that I actually liked the shift dress as it is so comfortable. It is also an iconic, 1960s, shape. I have written an ode to the shift here. 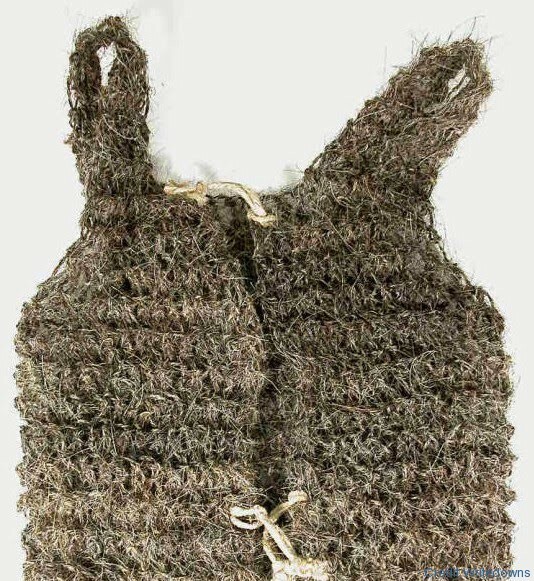 Once it is darted it looses its unique qualities, and it becomes a sheath dress. I explain the difference between a shift and a sheath dress here. So if I dart it, it becomes something else. It may be nicer, but it will not be the dress as designed. I am inclined to say I like it undarted as this is true to its heritage. You may remember in my consideration of this pattern (actually both the dress and the jacket) I mentioned that they were the perfect shape for a woman with a relatively straight figure. The truth is when I planned to make it I saw it had a chain belt. I bought a chain belt in the Shelter charity shop. But I didn’t like the draped look. No I wanted a proper waist belt. That means that I really want shape at the middle (I invariably wear a belt). So maybe I should just take the aspects I like from the dress – kimono sleeve and yoke, knee length, and put the blooming darts in. This is the decade of crowdsourcing and the wisdom of the larger group. You gave me style advice. So, impressionable/always open to suggestion, I thought I would make it again (allowing me to fix the underlining/lining problem) and also to introduce darts. 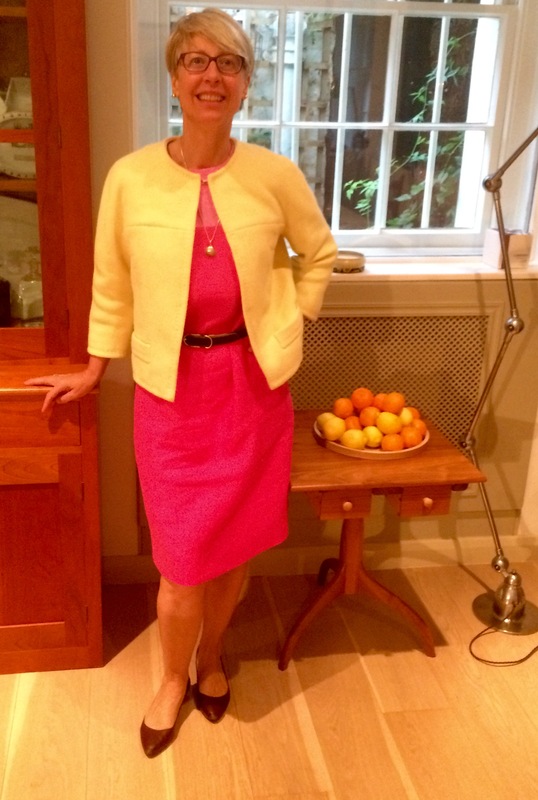 In terms of the length the pink dress is faithful original pattern, more or less – I took off just about 1cm. I thought I would go with a different colour way (who wants two almost identical dresses? ), but this time I would use some lighter weight linen. I wasn’t sure whether to underline or not, and in the end decided against, just lining the dress. I was wearing the pink one at the time, with the added slip, and I felt rather warm in it. The lining does give a little bit of body, even though I used a lightweight habotai silk. I also washed the linen, as suggested. But I didn’t scoop the neck as I thought it was fine as it was. Here is the fabric and lining cut out. 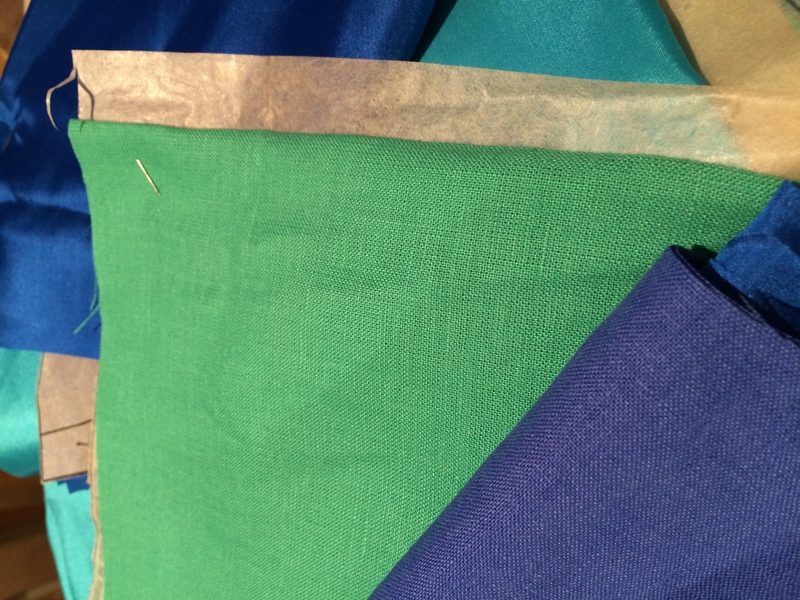 I didn’t have enough turquoise silk for the whole dress lining, so I will have a two-tone lining too. I will update you in a few days. Ooh those are lovely linen fabrics. I particulalrly like the green one. It will be a treat to see this completed. i love the addition of the yellow jacket – joyous and summery. Busy ogling the beautiful colours of fabric you have lined up. I think the original dress with the jacket is working. I’ve made a couple of waist slips recently in stretch lace.As well as taking virtually no sewing time, they add just enough stability to the outer garment without bulking. I love the strong blue/green colour contrast. I imagine the dress will look fabulous. I am pleased to see the original being worn as I like it. It looks great with the yellow jacket. Added sunshine! When I was younger, I had a shift dress in blue and green linen. I loved it. My memory doesn’t allow me to remember how close the shades were to yours. Prior to that, my mother had said ‘blue and green together should never be seen… ‘. Later that became ‘red and green…. ‘. Looking forward to seeing your dress. I’ll read your previous post re shift v sheath. Great solution. I often wear my mom’s old slips under things that I don’t want to line or that aren’t lined or that aren’t particularly comfortable. Easy and inexpensive solution. I love the colours for the new dress. The shape thing is interesting. I love the 1960s, undarted shift shape, which because of the volume probably does look best hemmed above the knee. On the other hand, I have an inclination to put a belt on such dresses, too. I once had a fabulous red silk shift that I didn’t belt that had some side bust darts and otherwise was a clear shift through the middle. It ended several inches above the knee though so maybe it’s just about getting that length/volume balance right. I really like your outfit your dress looks spot on, I appreciate that you considered all the suggestions made but I’m so glad that you decided to maintain the integrity of the style, you were right to do so it looks authentic. How does the this pattern compare to your Modrian? That fits you perfectly and doesn’t appear to have shaping iirc. Your linens are lovely and it’s such a great fabric to sew. Thank you Annie. I always appreciate your insights. I thought of the Mondrian dress when I wrote this post. I wear that one without a belt and it is less shaped at the side seam than this one. I have now made this Kimono sleeved dress with darts and I am quite pleased with it. Will write up as soon as I can get someone to take a photograph.